The University of Notre Dame is a special place, regarded by many as the world's top Catholic institution of higher learning. Yet its modern reputation for excellence and service is only part of the legacy of Father Theodore Hesburgh, the university's president from 1952 to 1987. Father Ted's influence extended beyond Notre Dame's campus in Northern Indiana. He worked with presidents, Popes, and Martin Luther King, Jr., and his guidance resulted in nuclear nonproliferation, immigration reform, and civil rights legislation. One of the many Domers influenced by Father Ted was Richard "Digger" Phelps, Notre Dame's men's basketball coach from 1971 to 1991. Phelps gives readers a seat at the table with Father Ted, from the basketball locker room in the 1970s to Father Ted's final Mass before he passed away in 2015. This account is an intimate portrait of an unlikely friendship and a rare look at the private moments of a man Digger often describes as "a living saint." The University of Notre Dame has an automatic association with excellence. From excellence in athletics to distinction in academics and service, Notre Dame’s impressive reputation wouldn’t be what it is today without the guidance of former university president Father Theodore Hesburgh, who truly lived his life in the service of others. 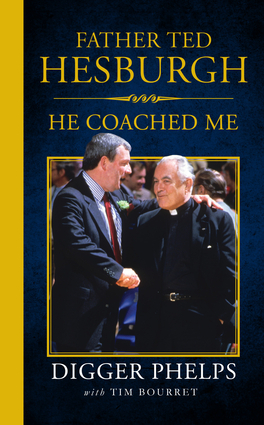 Father Ted Hesburgh: He Coached Me is an intimate portrait of an unlikely friendship and a rare look at the private moments of a man Digger often describes as “a living saint.” Phelps gives readers a seat at the table with Father Ted. From the basketball locker room in the 1970s to the final days of his life and everything in between, Phelps illustrates a man whose leadership and influence extends far beyond the confines of South Bend, Indiana. Richard "Digger" Phelps won 393 games in 20 seasons as the men's basketball coach at the University of Notre Dame. Since retiring from coaching, he has worked in President George H.W. Bush's White House administration (1992–93) and provided national commentary on college basketball for CBS and ESPN. Phelps lives in South Bend, Indiana. Tim Bourret, a Notre Dame alum, is the football Sports Information Director for the Clemson Sports Communications Office and coauthor of Tales from the Notre Dame Fighting Irish Locker Room and Basketball for Dummies. He lives in Seneca, South Carolina.